I did some really great riding this weekend. 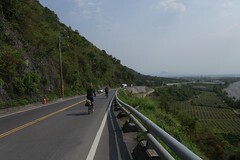 Saturday I went up to Guguan, always an enjoyable ride. Sunday I drove down to Shuili with Drew of Taiwan in Cycles and another friend, Andrew, and rode a little loop out of Shuili -- up 131 and over to 21, around the corner of Sun Moon Lake to Ita Thao (Dehua Village), then south out of Dehua Village on Nantou 63 back to 16 and Shuili (map). 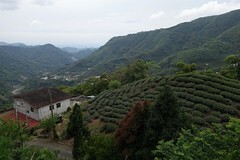 The picture above I took from a scenic spot on Nantou 63. It utterly fails to do justice to one of the most beautiful moments of my life: after lunch in Dehua Village, we followed the switchbacks up Nantou 63 to 800 meters, surmounted the ridge above Sun Moon Lake as it began to rain, and then beheld the utter glory of Taiwan at its most beautiful, the interplay of gentle light and rainy cloud in the deep mountains framing a classic alpine descent of switchbacks through farm, forest, and field down to Route 16 and the Choshui River. Pure biking heaven. Just knew the day would be good; the mountains were as clear as I have ever seen them as we drove down Highway 3 to Shuili. In Shuili a peanut seller was out harvesting sales in the early morning. Andrew readies for the ride. 131 sweeps north out of Shuili past the reservoir. 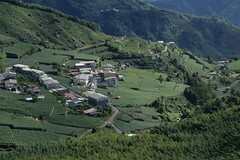 The grade is not difficult and the views across the betel nut covered slopes of Nantou are splendid. After farms comes a national forest. Tunnel on 131 in the land of betel nut trees. 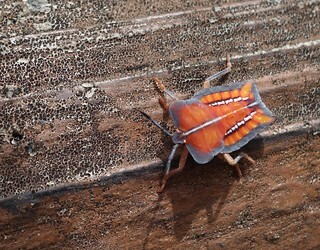 The rain and cool skies meant lots of critters out and about. On 131 nearing 21 just below Sun Moon Lake. In this area the B&Bs and other tourist stuff begins. Taking a break at Sun Moon Lake after climbing 21. Dehua was overrun with tourists, as always. After lunch and coffee in Dehua, we turned south onto Nantou 63 and began climbing the switchbacks out of the basin of Sun Moon Lake. There are excellent views over the lake on this side. Soon it began to drizzle. Not everybody was hiding from the rain. 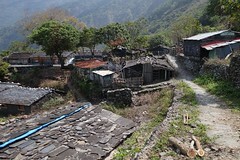 Coming over the other side, we found ourselves among the great peaks of central Taiwan. I didn't take many pics on this downhill, roughly 7 kms of switchbacks through the mountains, farms, and fields of central Taiwan. Just rolled slowly down, soaking it up. If it had just been the terrain, you might say "Whoa, awesome." Or if it had been the switchbacks, you might say, "Whoa, awesome." But together, the effect was amazing, especially on that day with the clouds and the light and the rain. Put Nantou 63 on your list, it is in a class by itself. At last we reached the bottom, and 16. Andrew rests at the bottom among the peaks lining the river. Drew waits out a cloudburst at a betel nut stand. Back to Shuili along 16. 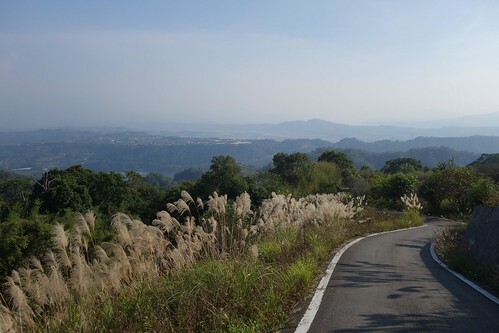 Looking back toward the imposing ranges of central Taiwan. What a wonderful ride. Hope your Sunday was as enjoyable as mine! mmm looks delicious. I love the dilemma of going downhill and seeing awesome stuff but not wanting to stop for photos - know exactly how it feels lol :). Yeah, 63 is splendid! But I've only been on it in a car. You lucky dogs.